Secondhand Spirits by Juliet Blackwell, a Mysterious Review. 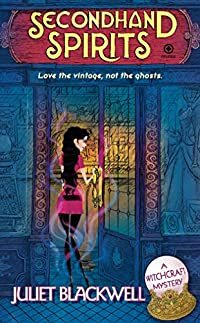 Review: Juliet Blackwell (a pseudonym for one of the two sisters who together write as Hailey Lind) debuts a new mystery series with Secondhand Spirits, featuring San Francisco vintage clothing store owner Lily Ivory … who also happens to be a natural born witch. Originally from Texas, Lily is relatively new to the Bay Area, having drifted around the world unsure where to settle and what to do with her life. She has opened a vintage clothing store, partly because it's an interesting business, but also because it allows her to connect in a special way to people of the past. When Frances Potts offers to sell her a rack full of dresses from the 40s, 50s, and 60s, she can't resist. But there's something both unusual and familiar about the old woman, and her clothes produce a disturbing reaction in Lily. When Frances is later killed, and a neighbor girl goes missing, Lily is sure there's a connection. Though she doesn't know many people in her new home town, she assembles a group of local witches in order to unmask the killer and find the little girl. At times Secondhand Spirits reads more like a meticulously researched paper on modern witchcraft than it does a mystery. To be sure, there are plenty of cozy elements--lots of girl talk; Lily pursued by two very different, but mysterious in their own way, men; clothes and shoes, even if they are from a different era; and a pot-bellied pig, who is really a creature of uncertain origin just assuming that form, taking the place of a cat--but the mystery plot is especially thin here. The focus seems to be much more on the rules and rituals, spells and potions, dos and don'ts of witchcraft. It's possible the author is simply laying a solid foundation for the series, but some of what goes on could easily have been moved to the second or third book, allowing the mystery storyline to be considerably tightened and the overall plot to be somewhat more cohesive. Lily, though, is a well-developed character, one with human insecurities and doubts, but also quite clever and resourceful. While there are a lot of interesting bits about witchcraft in Secondhand Spirits, she is the reason to read the book and to look forward to the next in the series. Acknowledgment: Penguin Group provided a copy of Secondhand Spirits for this review.